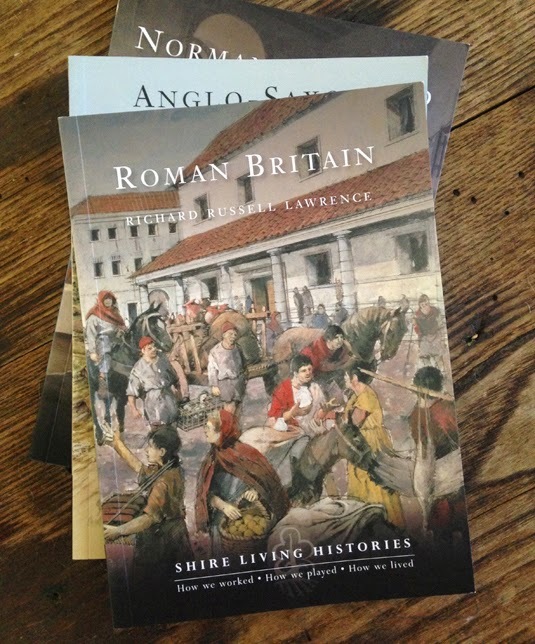 Roman Britain (2010) by Richard Russell Lawrence is the first book in the Shire Living Histories—short introductions to the different time periods in British history. Each well-illustrated book offers a social history addressed in the same chapters: Family Life, Home and Neighborhood, Work, Food and Drink, Shopping and Style, Transport, Leisure, Education and Social Service, and Health. Books in this series are small 5.8 x 8 inch books, and no more than 80 pages long. Lawrence covers the period 40-400 AD, giving a broad overview supported with a few specifics to illustrate his points. I feel the author was imprecise and may have overstated the influence of Roman agricultural techniques over the native British*, but overall he steers clear of the outmoded historians' concept of "Romanization" (the imposition of Roman culture on subjugated people). There are numerous history books on Roman Britain, and Lawrence's book is a good one for the general reader to start. Unfortunately, Shire's series lack bibliographies for further reading. *Archaeologists who specialize in Iron Age agriculture tend to say that the Roman plow did not replace the native ard, pigs were widely eaten in pre-Roman Britain, but sheep were raised mainly for wool (not food). P.S. Wargames Foundry sells some very nice 28mm Roman civilians models—farmers in tunics, men in togas, townspeople, etc. Paul painted some 1/72 scale Roman citizens made by Linear-b, which produces a lot of unique Romans sets. These look like good reads. After taking a year of Latin, my son (12) can't get enough of Roman history. Would they be on his level? Yes, my daughter is 12, and she's read a couple in the series.